Because Kira Johnson was so amazing (she spoke five languages, skydived, raced cars), she has been the face of what many are now coming to see as a crisis in black maternal health. Kira Johnson put a face on what activists have known for years—that black women’s rates of death during or up to a year after childbirth is on par with so-called third world nations. That a black woman with a college degree is more likely to suffer from maternal mortality and complications than a white woman who hasn’t finish high school. That driven in large part by black and Native women dying, the U.S. is the only industrialized nation with a rising maternal mortality rate. Those leading the fight, unsurprisingly, are black women, who lead organizations like the Black Mamas Matter Alliance or make caucuses dedicated to Black Maternal Health. And then there are those left picking up the pieces after losing mothers, sisters, cousins, partners, best friends and daughters in childbirth; people like Charles Johnson IV, Kira Johnson’s husband, now raising two small sons, Charles and Langston, after Kira’s grievous death. 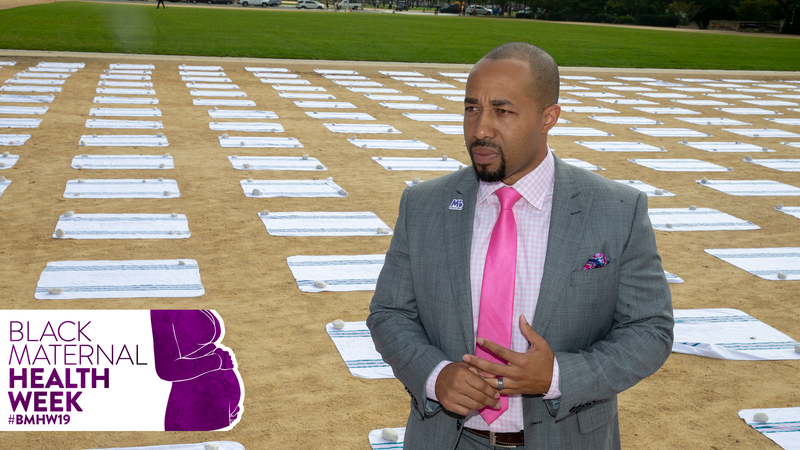 For Black Maternal Health Week, we spoke to Charles Johnson, who said that seeing Emmitt Till’s casket at the African American Museum of History and Culture inspired him to “let people see” that women are dying right here right now in America. The Root: Talk a little about how seeing the Emmett Till exhibit at NMAAHC inspired you? Charles Johnson IV: Just recalling in my mind Mamie Till and her approach about Emmitt and that experience. Her approach was we’re going to let the world see. Let them see. And let them see what happened to her son in the hopes that it would change the world. And have an impact far beyond what was immediate. And that his legacy would be one of change and inspiration, and this can’t continue to happen. And it inspired me, it touched me in a way that, as painful as it was with Kira; I have to let people see—by any means necessary. TR: How has having this issue enter popular culture helped your campaign to end preventable maternal deaths? TR: Do you think that if Kira wasn’t so phenomenal, upper middle class, beautiful, married to a man, do you think that it wouldn’t have resonated with so many folks? CJ: I think that is what has helped it. And I’m going to speak candidly. The reality of the situation is that there is a false stigma associated with women dying in childbirth. That they’re poor; that they don’t have access to adequate care; that they’re not diligent about their prenatal visits; that maybe they have hypertension and or pre-eclampsia. And there’s this false narrative and stigma attached to it that is very much, regardless of ethnic background, there is a sense of pseudo-victim blaming. Which is unfortunate. And I think that is one of the reasons Kira’s story has resonated. Because she defies every one of those narratives. But that in no way or shape or form is trying to marginalize every one of those narratives because every single mother is precious and they deserve to be here with their children. The reality of the situation is that there is a false stigma associated with women dying in childbirth. That they’re poor; that they don’t have access to adequate care; that they’re not diligent about their prenatal visits; that maybe they have hypertension and ... there is a sense of pseudo-victim blaming. TR: Can you give us an update on the status of your lawsuit against Cedars-Sinai? CJ: So the lawsuit is ongoing. And they have not accepted responsibility. They have not been transparent about what happened to Kira, how it happened. But even more troubling, they have not been transparent about what steps they’re taking to prevent this from continuing from happening to other women. So first and foremost, I would like for them to accept responsibility and be clear about the mistakes that were made. Not only for us so we can have understanding and closure, but so that other people can be clear and we can prevent this from happening. TR: In terms of policy, can you update us where new laws and such are? CJ: Last year we worked lobbying heavily in support of H.R. 1318, which is the Preventing Maternal Deaths Act of 2018, and I’m proud to say that after 18 months of fighting for what is the first-ever federal legislation to prevent maternal deaths. On Dec. 16, the day before President Trump shut down the government, so he signed it into law. Yep. Yep. And actually dedicated it to Kira on the floor of the Senate when it went up for a vote. But it is just the first step. It needs to be followed by more legislation that is more aggressive that calls for sweeping reform in maternal care. That calls for high levels of transparency and high levels of accountability. TR: What’s one of the biggest challenges in stopping maternal deaths in the U.S.? CJ: The one thing among other challenges we see in maternal healthcare is that there’s not a fundamental standard of care across the board. If you go into trauma, there is a clear set of protocols; if you are in ER, there is a clear set — if this happens, [then] this happens. [In childbirth] women are left in situations where too much room for arbitrary decision making. It allows bias to get in, it allows care provider error to seep in, and for women to be marginalized or dismissed. And we’ve got to have a clear fundamental standard of care and we’ve got to have rules and regulations and a set of accountability factors that hospitals and care providers [have to meet]. And those are some of the things I hope to see happening in the very near future. TR: Do you think that the outcome would have been different had Kira been white? TR: Should pregnant women—especially black pregnant women—be scared to give birth in this country? CJ: One of the things that is hardest for me about this is that I hear so many black families who say they’ve heard Kira’s story and they’re scared. They’re scared. And I never want families to be scared, I want them to be informed and empowered. Right? And I want them to understand the risks of childbirth and I want them to be prepared to be able to ask their providers very specific questions and hold them accountable and make sure they’re transparent with them about their options. TR: What can black women and families do to mitigate some of the very real risks? CJ: The first thing is very simple. Speak Kira’s name. Ask your healthcare provider have they heard about Kira Johnson, and what are they prepared to do so the same thing doesn’t happen. Be empowered. Ask questions. Make sure that you have loved ones that understand your expectations for your care and are prepared to lobby for you. There’s a lot more resources that we’re going to be sharing on social media at 4kira4moms and also on our website, about how to advocate for care, and to find out what your patient bill of rights are. We want people to be excited because this should be the most, the happiest time of your lives. But we have to make sure. That’s why I’m here to fight to make sure that doctors are on their toes, and that they’re coming into these situations with a level of transparency and compassion for their patients. So these wonderful mothers can go home with their children. Do you think that the outcome would have been different had Kira been white? Yes. TR: Are you finding a community with other dads who have faced similar circumstances? Yeah, I am. Unfortunately, there’s this growing extended family, I wouldn’t say just fathers, but of loved ones, all over the country. I try to do my best to reach out to them so there’s reciprocity. And what we’re trying to do on 4kira4moms is launching a maternal mortality response team [where] in the event that a woman unfortunately passes away in this country, we want to be able to mobilize and support that family anywhere in the country within 72 hours. To be on the ground, to make sure they have the practical things that they need to take care of a baby. I don’t want him to think about buying diapers for a year; we have counseling if they need it. And in the event that they need legal resources, I want to be able to support them in that way too. [In addition to the advocacy and amplification], I want to be of service to those that this is happening to as well. So that’s one of the things that were’ going to be rolling out this year. TR: How are your baby boys doing? CJ: Oh my gosh. They’re so awesome. My son still asks when’s my mommy coming home they ask why she can’t come to soccer games. But they’re just cool little guys and they have all the best parts of their mom. So we have Langston and he started Jiu Jitsu yesterday. They are in a language immersion school learning Mandarin; you know, Kira spoke five languages. They’re just super cool little guys and we just approach every day the same: We just wake up, make Mommy proud, repeat.